There’s a lot you need to take into consideration if you’re getting ready to sell your home. Like we outlined in our last blog, you need an accurate valuation of your home in order to prepare to negotiate with potential buyers, have high-quality images and 3D walkthroughs of your home, and have your home listed on a reliable listing website. 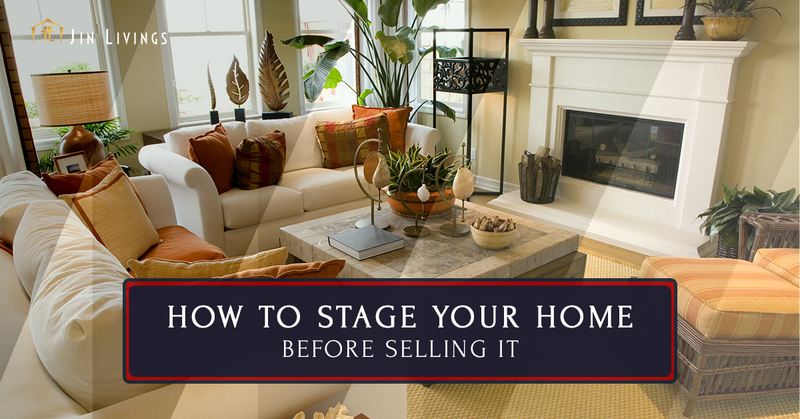 However, one thing in particular that you should focus on is how you stage your home before it goes on the market. Here at Jin Livings, we are real estate experts who know exactly how to stage your home and prepare it for market. Give us a call if you have any questions. The first step in staging any home is to clean everything up. If you’re in the process of moving, this may be the perfect time to stage your home so that you don’t have to keep coming back after moving into your new home. Ideally, you’ll want to dust and vacuum everything and even have your carpets professionally cleaned. Not only will this make them shine, but they’ll smell as good as new adding that extra touch for anyone who enters your home. Dealing with both major and minor repairs on your home is extremely important, especially if you’re selling in a competitive buyer’s market. If your windows are drafty, there’s a leak, or your carpet is damaged, these are things that potential buyers will notice immediately, and they’ll just move on to the next home on their list. Think of staging a home as the exact opposite of designing. Instead of adding a personal touch, you’re trying to remove all traces of having been there. Rather, you should opt for a neutral design that could appeal to a wide audience. This way, potential buyers will see the home as more of a clean slate rather than something that’s been personalized towards someone else’s preferences. Although you want to depersonalize to the point of the design being neutral, that doesn’t’ mean leaving floors or walls completely bare. If you remove too much furniture and decorations from your home, it will look bare and the potential buyer won’t have an accurate picture of what it will look like when they move in. Possibly the most important thing you can do before you put a home up for sale is to fix up the exterior of your home, especially your home’s landscaping. Not only will the exterior be the first and last impression potential buyers have of your home, but in a way, the exterior represents the status of the home within the neighborhood. So, if your home’s exterior looks better than all the houses surrounding it, this will be appealing to a lot of homebuyers. On the other hand, if it looks worse, homebuyers likely won’t even commit to touring the interior of the home. Although anyone can sell a home with enough patience, working with the right people along the way is a must. At Jin Livings, we offer listing packages for home sellers in the San Francisco Bay Area. Our team of real estate experts will provide you with professional photos and 3D walkthroughs, premium placement on all major listing sites such as MLS listing, Zillow, Trulia, as well as a custom staging plan for your home. Give us a call if you have any questions or you’re ready to get started.